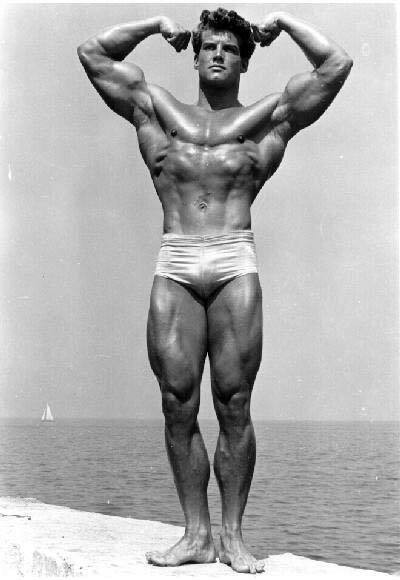 So I got this from other articles located at http://classicphysiquebuilder.blogspot.com/ This a great little resource about the origins of bodybuilding. I did not do the workouts verbatim, however I did create a routine that was a full body routine using all main muscle groups of the body as suggested by the blog above. For each exercise, do 1 work set of 8-12 repetitions. Now, this may sound like too little, as I thought when I first tried this, but trust me. Its insane after a while. If you do this right, you will be sweating like an animal and feeling like you just ran a 100m dash. The exercises can be replaced with dumbbell movements. Example: doing dumbbell press instead of barbell press. Below is what I did. However, the main point is to have some form of squat, overhead press, rowing movement, curl movement and calf raise movement. So if you want to do front squats instead. Go for it. The only thing different is on the third day you replace the row with the deadlift. If I had to this all over again, I would just do Dips, push ups, or pull overs instead of bench press. Lets say you did a Squat for a 135 lb work set and only did 9 reps. You stay at that weight until you get 12 full reps and can barely get 13. Once you do that, you increase the weight. Be conservative. Go up in 2.5 to 5 lb increments. In between Sets take as little time as possible. I would use somewhere between 1-2 minutes. Sometimes I would take more, I would just go by how my body felt. For the heavy deadlifts, I would take about 3-5 minutes between sets. Maybe more if it was a weight I never did before. For the deadlift you will always do sets of 5. 135 x 5 Warm Up. This should be an easy set. 185 x 5 Warm Up. Should be able to get 5 reps with maybe a moderate difficulty. 225 x 5 Work Set. You will get the first 3 reps, and the last 2 will be the hardest. You may not even get 5. but thats okay. Do not increase weight until you hit 5 reps.
As the weight gets heavy over time, you might need to add another warm up set. That is about it! I say go visit the blog I posted above. Its awesome! I do not think its active, but there are still lots of cool pictures up there and interesting reads. Take care guys! Good luck trying to look like Steve Reeves! Not sure if you have checked out these guys before but they are really into the physical culture stuff too. Chip Conrad did some vids on the history of the physical subculture too which was rad…they are on YouTube I believe. I willdefinitely check this out. Thanks!